With effect from 1 January 2018, CARAT and Eschborn based Orio Deutschland GmbH, will become a member of ad-CARGO network. The automotive spare parts specialist Orio continues to expand its product range. The parts specialist Orio - also a member of the GVA (German association of independent auto parts traders) since March 1, 2017 - started last year with a carefully selected assortment of high-quality wear and service parts in OEM quality for all common car makes and models. As part of the continuous expansion of the product range, Orio becomes CARAT cooperation partner as well as ad-CARGO limited partner from 01.01.2018 and thus has access to the entire product range of the ad-CARGO warehouse with more than 120,000 article references. As a result, Orio will have an extensive spare parts program from 2018 onwards, enabling it to meet almost every need of workshops and trading partners. The customers are supplied from the Orio regional warehouse near Frankfurt am Main with its proven logistics and distribution concept as well as the ad-CARGO logistics in Castrop-Rauxel, which has also been delivering high delivery performance for years. All spare parts distributed by Orio continue to be covered by a 3-year warranty including removal and installation costs, which underlines Orio's high-quality standards. For the CARAT management, with the entry of Orio, the decision adopted at the CARAT shareholders' meeting in May, "opening up the supply warehouse ad-CARGO", was absolutely correct. 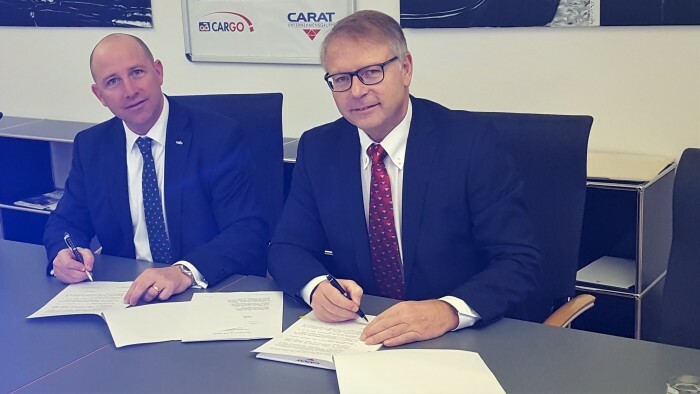 Thomas Vollmar, Managing Director of CARAT Group / ad Cargo: "We are very pleased to have gained Orio as a capable partner with its nationwide sales network for our group. With our comprehensive range of first and second brands, we will support Orio to take a stronger market position." Jan-Philipp Schuhmacher, Managing Director of Orio Germany: "The cooperation concluded today with CARAT / ad-CARGO marks another important milestone in our dynamic corporate development. It will be with the significantly extended product range that we succeed even better in meeting the needs of our customers in the future." Worldwide trading company for automotive spare parts headquartered in Nyköping, Sweden (about 100 km south of Stockholm). The company originated from the former car manufacturer Saab and its trading subsidiary Saab Automobile Parts. At the end of 2013, the company was renamed Orio. In addition to producing and distributing original Saab spare parts, Orio offers a wide range of automotive parts and accessories for all free-market brands. The company has a central warehouse in Sweden with a storage area of around 88,000 m2 and over 70,000 items as well as five regional warehouses, including Germany (Frankfurt / Main) with more than 3,500 m2. The German subsidiary, Orio Deutschland GmbH, is one of nine branches in the main markets in Europe and the USA. Since 2014, the sales area Germany, Austria and Switzerland (with its own branch office) are under joint management. CARAT has a nationwide dealer network and, with a group turnover of over € 1.5 billion and more than 140 associate companies, is one of the largest independent automotive parts cooperation’s in the German market; By connecting to the ADI, CARAT is part of the most important parts cooperation in Europe. CARAT consists of the system centers SGH - assortment wholesaler, the head office for workshop concepts with the brands ad AUTO SERVICE / ad truckdrive / AUTO MOBIL MASTER WORKSHOP / TRUCK, TRUCK SERVICE-THE PROFESSIONAL WORKSHOP, the specialist market system AUTOplus, the specialist business system CARAT Autoteilewelt, the truck Parts trade truckdrive and the paint specialist body & paint with the workshop system CARCOLOR - YOUR BODY AND PAINTING PROFILE together. Further information at: www.carat-gruppe.de.